Sealife Free 1 Child Ticket With The Purchase Of One Standard Full-price Adult Admission Ticket. Take advantage of 18 euros in the Annual Pass for Sea Life Benalmádena. Enjoy the ticket price of Sealife + Minigolf from 13,45 euros in Sea Life Benalmádena. 30% off in Sea Life. Sea Life is a company that has more than 50 centers around the world and belongs to the firm Merlin Entertainment, which was founded in 1998; Sea Life was targeted to become the world's largest aquarium brand with facilities in UK, Germany, the rest of Europe and the United States where its visitors will immerse themselves in an incredible underwater world and see a wide variety of species such as sharks , sea urchins, rays, various fish, crabs, lobsters, among others, more than 180,000 creatures within sight, distributed in wonderful thematic habitats. Sea Life is the place to enjoy, achieve maximum fun and learn many new things, contemplating a fascinating environment for children and adults. Get the best prices by making use of discount vouchers found online and thus, enjoy and save with your visit to the most impressive aquarium in the world. What more can you ask for? 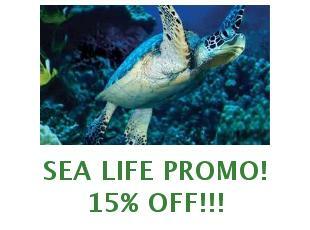 Find your coupon and buy now at visitsealife.com with discounts!